Light—it’s the main element in every photograph. It’s light that photographers endlessly chase in the field, strive to create and shape in the studio or artfully enhance in the digital darkroom. It’s light that creates the mood in a scene—and in a photograph. Simply put, it’s all about the light. Light can illuminate a subject from many directions: front, side, top, back and even from within. In this column, I’ll cover how to take a backlit photograph and how to process it. 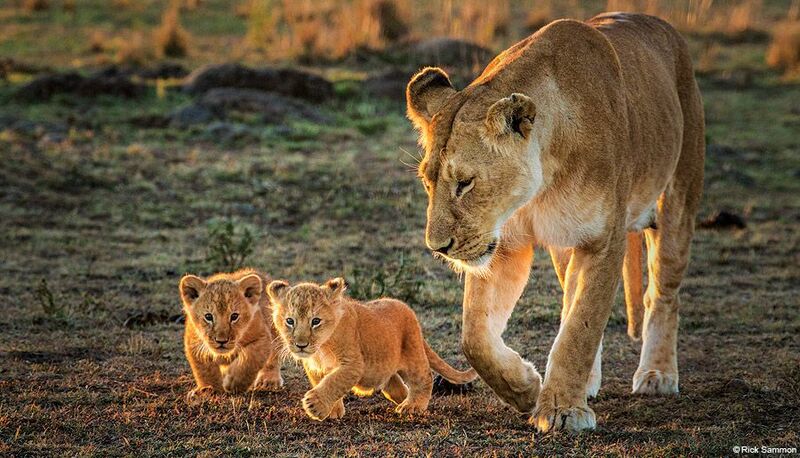 To illustrate the techniques, I’ll use a photograph of a lioness and her cubs that I took in Kenya’s Masai Mara. Here’s my original photograph. As you can see, the opening image for this column is a cropped version of this file. Although I like the little guy on the right, I wanted to create an image with impact, so I cropped in tight. A side note: Cropping is very subjective. It also gives us a second chance at creative composition. Combine composition with cropping, and you have what I call "cropasition." When shooting a backlit subject, an important goal, as I mentioned, is to preserve the highlights—the brightest part of the scene. If the bright parts of the lions’ fur were overexposed more than one stop or so in this photograph, the details would be lost forever, even to a skilled Photoshop or Lightroom expert. In situations like this, therefore, you need to expose for the highlights. Shoot with your Highlight Alert/Overexposure Warning activated and make sure you don’t have any "blinkies," which indicate over­exposed areas of a scene. I used Lightroom to enhance my image, but the same basic controls are available in Adobe Camera Raw, Photoshop and Photoshop Elements. Here’s a screen grab of Lightroom that shows my imported image without any adjustments/enhancements. Here’s a screen grab of the Adjustment window. Following are the adjustments and enhancements I made and why. Exposure: I boosted it a bit to open up the shadows without overexposing the highlights. Highlights: Decreased to retain detail in the highlight areas, which were a little bright after I boosted the exposure. Shadows: I opened up all the way to see detail in the animals’ faces. Whites: Increased slightly to bring out some shadow detail. Blacks: Decreased to add some drama to the photograph, which is something I do on a regular basis to my images. Clarity: Boosted to bring out some detail in the shadow areas. Vibrance: Boosted to enhance the color in non-saturated areas of the scene. So, the idea here, as always, is to start with the very best in-camera image and then get to work (and have fun) in the digital darkroom. Rick Sammon is a longtime friend of this magazine. See more of his work at ricksammon.com. Great tips. I like the glow around the lions. Very cool.